A delightfully rich, varied and virtuosically performed collection of music for oboe and guitar ranging from the 18th century to the present. 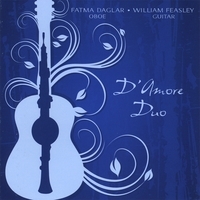 The D'Amore Duo has been described by the Washington Post as a "perfect partnership of sound". On this, their second album, the duo performs music ranging from a sonata by WF Rust (1739-1796) arranged from the original harp and flute by William Feasley to music written for oboe and guitar by 19th century composers Napoleon Coste and Ferdinand Rebay to contemporary works written for the duo by the Cuban American composer Jose Manuel Lezcano and the Swedish composer Staffan Isback.